North Union’s Trevyn Feasel and Clear Fork’s Trevon Trammell and James Watts scramble for a first-half fumble Friday night. The Colts won their fourth game in a row, 42-14, after a close first half. BELLVILLE — A good team needs tested to become a great one. 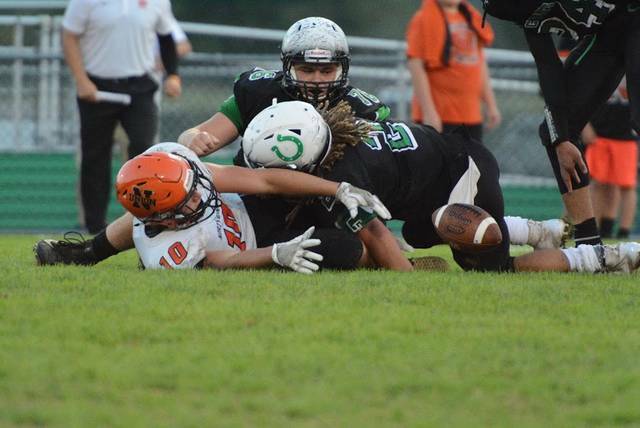 Clear Fork (4-0) received that test in the first half Friday night against MOAC opponent North Union (3-1), with the Colts overcoming a close first half that had them ahead just 14-7. Two third-quarter touchdowns broke open a 14-14 game and Clear Fork pulled away for a 42-14 victory. After a 64-yard toss from Jared Schaefer to Zach Homerick, a key third-and-seven play at the Wildcats’ 8 yard-line provided the spark. North Union jumped offside on a 25-yard field goal attempt. With the extra 5 yards, Clear Fork head coach Dave Carroll chose to go for it and scored when Schaefer found the end zone from 3 yards out. Carroll knew the Wildcats would offer a strong challenge. The Wildcats averaged 58 per game and allowed just 10 entering the game. They rushed for 200 yards against Clear Fork. Schaefer had a strong performance, passing for 102 yards on 5-of-7 attempts. He also was the Colts’ leading ground gainer with 84 yards on 10 carries. Schaefer and Brennan South split quarterback duties for the Colts. South was 4-of-6 with 65 yards and a 24-yard scoring strike to Gabe Blauser. “We struggled in the first half. We didn’t do the job we should over the first half,” Schaefer said. But Schaefer and the Colts defense stepped it up in the second half. For the game North Union had three turnovers, including interceptions by Schaefer and Ashton Lyon. Trevon Trammell scored from a yard out and Collin Crider went in from 15 yards to put the game out of reach. Trammell has 414 yards rushing and 8 touchdowns on the season. Jay Swainhart and Tacoma Orr recorded sacks for the Colts, which had 15 first downs to the Wildcats 11. Trevor Moran scored on a 7-yard run and NU quarterback Anthony Padovano hit Carson Smith with a 30-yard post for their two scores. Moran ran for 141 yards on 23 carries. The Colts will visit Buckeye Valley, which pulled out a last-second win over River Valley 8-6 Friday night. The Wildcats host Ontario, which beat Marion Harding, 28-7.
https://www.thebellvillestar.com/wp-content/uploads/sites/39/2018/09/web1_N71_0576-1.jpgNorth Union’s Trevyn Feasel and Clear Fork’s Trevon Trammell and James Watts scramble for a first-half fumble Friday night. The Colts won their fourth game in a row, 42-14, after a close first half.